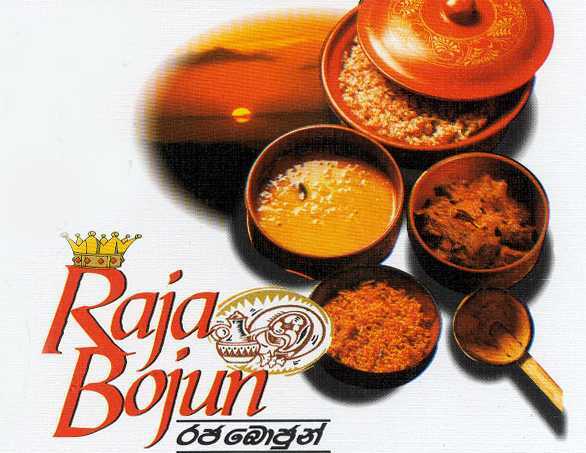 There is a popular myth in the west that the eating of curries is bad to your system and health, because of the variety of pungent spices and condiments used in the mouth watery traditional Sri Lankan dishes. On the contrary, curries are actually good for the health, especially digestion, if prepared with the ingredients discovered and used by the ancients. Most spices and condiments used in curries are reservatives, some have antiseptic value, others are carminatives, and still others are rich in natural oils, vitamins and minerals. However, incorrect methods of cleaning and cooking, will destroy these food values and also vary the taste of meals. 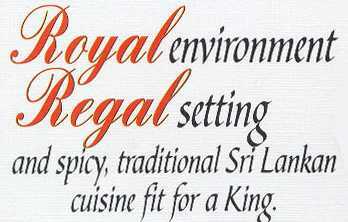 The food can be made either hot and spicy or very mild, to suit individual tastes. But the secret to a good curry is the mix that goes in to make the "curry powder" and how and when it is used in cooking. 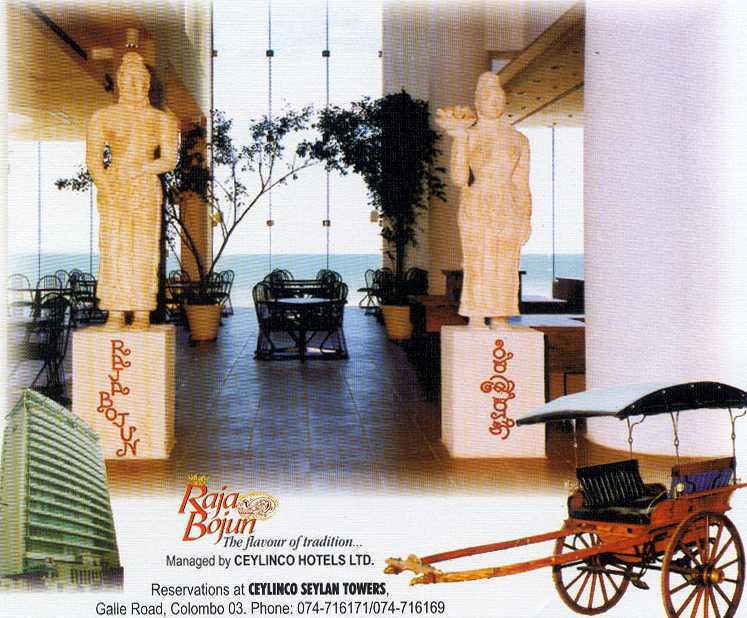 While you are in Sri Lanka, why not enter the royal setting of a charming restaurant in the city of Colombo itself called " RAJA BOJUN ", managed by the reputed Ceylinco Hotels Limited. It will certainly be an unforgettable journey that will remain "down your memory lane", through a series of traditionally prepared Sri Lankan Dishes which will amaze your taste buds. It's open from 10 a.m. to 12 mid night on all seven days of the week. SRI LANKA HOSTS THEIR FIRST ODI. 13th February 1982 was a red letter day in the annals of Sri Lankan Cricket. At the Sinhalese Sports Club Grounds in Colombo, England team captained by Keith Fletcher met Sri Lanka team led by Bandula Warnapura in a 45 - overs match, which happened to be the first ever one-day international that was played on home soil. Although Sri Lanka had played only five previous ODIs (during the 1975 and 1979 World Cups in England), by then they have stunned the cricketing world with their performance, especially in beating the much experienced Indians by 47 runs at the 'Old Trafford' Manchester in June 1979. Hence although it was just two ODIS and a single Test Match tour here, England never wanted to gamble and sent a star-studded team lead by Keith Fletcher that included English Cricket Stars like Graham Gooch, David Gower , Ian Botham, Mike Gatting, Geoff Cook, Derrick Underwood, John Embury and Bob Willis. It was ODI debut for Paul Allott (England), Ashantha de Mel and Sidath Wettimuny (Sri Lanka England opened with Gooch and Cook after being put into bat.For Sri Lanka Ashantha de Mel shared the new red ball with the late Anura Ranasinghe. A majestic 64 runs off 107 balls with eight boundaries by Graham Gooch followed by a belligerent 60 in 51 balls with seven boundaries and two hefty sixers by the Man of the Match Ian 'Beeffy' Botham paved the way for England to reach 211 all out in 44.4 overs. De Mel (4 for 34) and Anura Ranasinghe (8 overs for just 20 runs) bowled best for the home team. After an encouraging start with a 34 run opening stand between Sidath Wettimuny (46 in 80 balls) and Captain Bandula Warnapura (10 in 25 balls), Sri Lanka soon lost wicket keeper-bat Rohan Jayasekera( 17), Roy Dias (04) and Duleep Mendis (02) to be placed precariously at 92 for five. In walked Anura Ranasinghe and he with Ranjan Madugalle at the other end, they put a stubborn 68 runs stand for the 6th wicket before Willis bowled Madugalle for almost a run a ball 22 and Ian Botham had Ranasinghe caught for a brilliant 51 runs made in just 41 balls with three boundaries to be 187 for 6. Desperate attempts through a 19 run unbroken stand by Ashantha de Mel (13 in 17 balls) and Lalith Kaluperuma (14 in 14 balls) , failed to bring Sri Lanka a well deserving victory as they ended up just five runs behind the England total. A HISTORIC WIN FOR SRI LANKA. However, a never-say-die Sri Lankan team on the very next day itself in the Second ODI on home soil, turned tables to beat the much fancied England at the same venue, to record their first ODI victory on home soil and also the first ODI win over England as well. Sri Lanka made two changes, Mahesh Gunatilleke coming in for Rohan Jayasekera behind the sticks and a promising Schoolboy Cricketer,Arjuna Ranatunga replacing Lalith Kaluperuma.Sent in to bat first, home side were soon in great trouble. With the total on five, Ian Botham struck twice to remove Bandula Warnapura (04) and Duleep Mendis (00). The score at 43 for 2, Roy Dias was tragically out hit wicket to John Lever (coming in for John Embury in the team) for another elegant 26 runs off just 36 balls with four delightful boundaries. Arjuna Ranatunga then joined Sidath Wettimuny who was then doing the bulk scoring with ease from the opposite end. A 87 run stand between them saw Lanka reach 130 for 3. Then again two quick wickets fell at the same score. At first Ranatunga was run out for a well compiled 42 in 53 balls and Derrick Underwood had Anura Ranasinghe caught for no score. A fighting unbeaten 86 off 109 balls with eight boundaries by Sidath Wettimuny enabled Sri Lanka to reach 215 for 7 in 45 overs.Incidentally,Sidath Wettimuny became the first Sri Lankan to carry his bat in an ODI and fittingly was judged later,'Man of the Match' for this heroic efforts Ashantha de Mel once again bowled very economically ( 8.5 overs for just 14 runs and 2 wickets). But Anura Ranasinghe (37 runs) and Bandula Warnapura (42 runs) in their allotted 9 overs each proved costly as Gooch and Cook produced 37 runs in the first ten overs and another 41 in the next ten overs. A 109 run stand between Gooch (74 in 85 balls) and Cook (32 in 81 balls) before they both fell to the brilliant stumpings by Mahesh Gunatilleke off the crafty left armer Ajith de Silva (2 for 44), set the foundation for another England victory. With the cheap dismissals of Gower (05), Botham (13) and Tavare (05), England were 171 for 5 at the end of the 40th over, still requiring 44 runs for victory. Then the great uncertainties of cricket saw a dramatic change in the game as four England batsmen ran themselves out, Keith Fletcher for 38 off 48 balls, Mike Gatting for 18, Bob Taylor for 03 and Derrick Underwood for 00. Off the last two balls in Ashantha de Mel's final over England required four runs.But de Mel had the last man Bob Willis caught by Madugalle in his last but one ball to register that historic ODI win on home soil. ENGLAND - SRI LANKA ODI SERIES TITBITS. (a). England have hosted Sri Lanka for a total of 9 ODIs. England had won 07 and Sri Lanka 02. (b). Sri Lanka have hosted England for a total of 7 ODIs. England had won 01 and Sri Lanka 06. (c). Both countries have also met at neutral venues 14 times. England had won 10 and Sri Lanka 06. Grand Total = 30 ODIs has been played between the two Countries. England had won 18 and Sri Lanka 12. England 333 / 9 at Taunton in 1983. Sri Lanka 286 / 10 at Taunton in 1983. England 212 / 10 at the SSC in 1982. Sri Lanka 250 / 5 at Premadasa St. in 1993. England ? Sri Lanka 136 / 10 at Leeds in 1983. England 143 / 10 at Dambulla in 2001. Sri Lanka 206 / 8 at the SSC in 1982. David Gower 130 at Taunton in 1983. Marvan Atapattu 132 n.o. at Lord's in 1998. Graham Gooch 74 at the SSC in 1982. R. Kaluwitharana 102 n.o. at SSC in 2001. Vic Marks 5 / 39 at Taunton in 1983. Muttiah Muralitharan 5 / 34 at Lord's in 1998. IN R HS AV. 100 IN = Innings Played. Sanath Jayasuriya. 19 682 112 37.88 02 HS = Highest Score. Graham Hick. 15 587 126* 48.91 01 AV. = Average. Muttiah Muralitharan. 12 397 21 18.90 W = Wickets Taken. Chaminda Vaas. 17 653 20 32.65 AV. = Average.